Buying from a street ticket tout is a chancy business, and not advisable - but if you are prepared to take the risk then there are some aspects to be aware of. The traditional tout – the shifty individual that lurks around concert queues hawking second hand tickets – is a dying breed. He is fast being superseded by the bedroom ticket tout, an altogether more modern, anonymous and efficient enterprise, who sells on tickets over the internet, using websites like eBay. Nevertheless the flesh and blood tout still performs a service for those who, at the last minute, either have a spare ticket to sell or desperately need one. Also if you missed out on securing a ticket for a show, and can bear waiting until the last minute, the tout will likely offer a much cheaper option than the internet touts. As an unregulated and illegal trader, a street tout is customarily a disreputable figure and so striking a deal with one can be a risky business. Whilst a great many have secured that dream ticket, countless others have been roundly ripped off. It is therefore strongly advised to avoid dealing with a tout. However, if the tout is your only option and you’re prepared to take the risk, remember that the police may not be able to help if things go awry. The law around street touting is based on the simple rule of ‘buyer beware’. One of the potential hazards that the buyer faces is that the tickets could be forged. The risk you therefore take is in paying money for a ticket that is useless, and won’t even get you in to see the show. It is sensible to already have a good idea what the ticket looks like. You could ask somebody in the queue to see theirs, and pay particular attention to any distinguishing security marks, such as a hologram. It is also said that you can tell a fake ticket by the substandard quality of the paper. If you are buying tickets for a seated event, it may be that with a last minute tout purchase you are unable to check the position of the seats. You could be sold awful seats with a restricted view. If you approach a tout it should be with the purpose of enquiring about their ticket prices, and not with the sole intention of handing over your cash. If a tout knows you won’t leave them without buying a ticket, they can charge what they like. What is the original ticket face value? How much more am I expected to pay? Is it really worth the extra money? Couldn’t I use the money to attend two or three other shows? The most important thing to remember when approaching a street tout is that they are as much on the back foot as you. They want to sell their tickets as much as you want to buy one, because when the event starts, each ticket still in their hands will suddenly become utterly worthless. Leave it until the last minute - the later you approach the tout the more desperate they will be to sell it, and the price will reflect this. 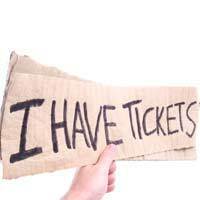 Don’t act desperate - if you behave as if you desperately need a ticket then the tout will take advantage. Acting as though you’d pay a sensible price but wouldn’t be fussed if you didn’t get a ticket at all will likely prompt the tout to try to strike a fair deal. Never let them know how much money you have – if anything infer that only have as much as you are willing to spend. By saying you can only pay £25 is forcing the tout into a corner. Can they risk waiting for a better offer? Walk away – discuss the ticket price, but don’t pay straight away. Say you’ll think about it and walk away. They’ll then know they’ll need to make an effort to entice you to buy.